Pebble Smartwatch is an excellent wearable device considering its price range, and the fact that it works with both Android and iOS devices. If you’re a Pizza lover, you be glad to know that Pebble finally gets a dedicated Dominos app which enable users to track their order from their wrist. The Domino’s Pizza Pebble app brings the company’s Domino’s Tracker system to your watch, letting you follow your pizza’s journey from order, to baking, and (the best part) delivery. Take the app for a spin the next time a pizza craving hits you! In addition to Domino’s debut on the appstore, we’ve got a new round of Apps of the Week to enjoy. Give these picks a go and check back next time for the latest round awesomeness. It’s not just the Dominos app, NFL Scorecard app is also available for the smartwatch, which allows fans to follow their favorite teams and check scorecards of matches. Several other decent app additions are also available for Pebble, including Shake Dice, and many more. 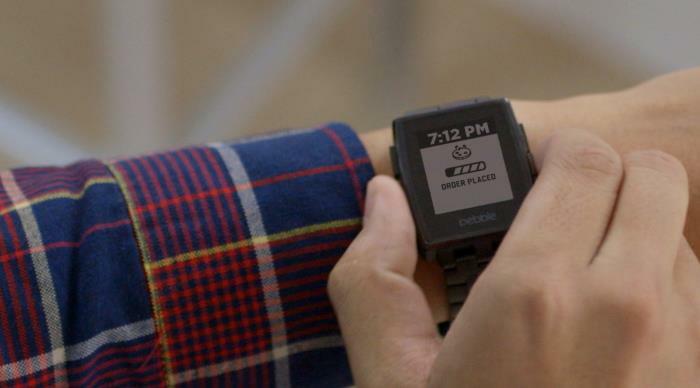 Do you own a Pebble smartwatch? Let us know about your thoughts about the smartwatch in the comments below.